Our lunch program has changed. We are now offering catered food on Mondays and Wednesdays. We encourage you to try it out and let us know what you and your kids think. We are now accepting applications for the 2019-2020 school year. A Student Pick-Up Form and After School Dismissal Arrangements need to be filled out for each student. If you have not done so, please press the "Click here" button below. Register today for two different STEM Engineering Summer camps with LEGO Materials. 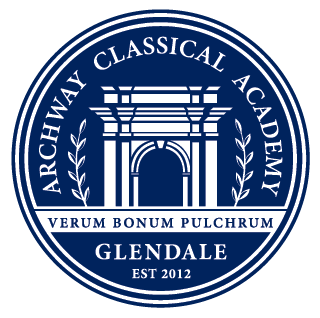 Archway Glendale is a part of the Great Hearts network of non-profit public charter schools dedicated to improving education nationwide through classical liberal arts academies. A Great Hearts education prepares students to be more than just proficient test takers, but rather, to become great-hearted leaders capable of success throughout their higher education and professional careers. With a curriculum built upon a classical liberal arts tradition and a revolutionary approach to school itself, Great Hearts cultivates the hearts and minds of students in the pursuit of Truth, Goodness and Beauty. Each student will be provided with a durable foundation in reading, writing, arithmetic, geometry, science and social studies, in addition to meaningful and substantive work and play in foreign language, fine arts and P.E. Notice of Board Meeting, December 4, 2018. Except for Half Days, Special Events, Holidays and Summer.